Lviv is often called as city of student and youth. In fact, here is situated an example of Ukrainian and European university that is one of the oldest education establishment of Europe and Ukraine. 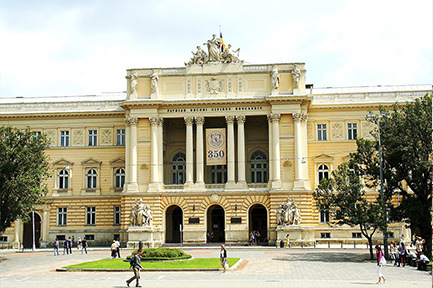 Throughout its history, the Ivan Franko National University of Lviv remained the cultural and scientific center of all Galicia – and let the historical epochs change. The era of the Polish feudal lords, the Austro-Hungarian monarchy, the bourgeois Poland-LNU survived everything, on the contrary, strengthening its educational traditions. History of University began since middle of XVII century – in 1661 year as Jesuit academy created by Jan II Kazimierz. Obviously that the basis of the program was same as in Jesuit schools. Program that was developed in the end of 16 century! And it was like that till 18 century – only then program began to change. The academy had just opened as it passed few years and there were counted over 500 students. With it was working as library as printing house. Certainly, everything couldn’t be perfect – in that years were few attempts to close modern Franka Lviv’s university, often were changed a statute, but despite everything, university managed to preserve it educational traditions and it’s identity and bring them to this day. Lviv’s National University has the name of prominent in history figure, writer, prosaist , scientist, historian, journalist, public-political figure, playwright Ivana Franka. It was at this educational institution that Franco studied at the Faculty of Philosophy, but was excluded from it. The reason for this was his active public activity in the late 70’s of the 19th century. the lawyers of Alexander Ogonovsky and S. Dnistryansky. For those who visit Lviv first time, the University of Franko will definitely become a tourist destination on the route, because its rich history and buildings of incredible beauty are truly charming. In addition, he has an extremely advantageous location – in the very center of the city. That is why, for all the guests of the city of L’viv, we recommend searching for hotels near the Franka University – this is a really great starting point for any plans. Hotel Edem is quite close – only 5 minutes walk through the Franko park! In addition, we offer free parking for our guests, breakfast are included and a children’s menu in the restaurant. The perfect service and true Lviv hospitality are what awaits you at the Edem Hotel.